After receiving this welcoming invitation, I was compelled to respond. 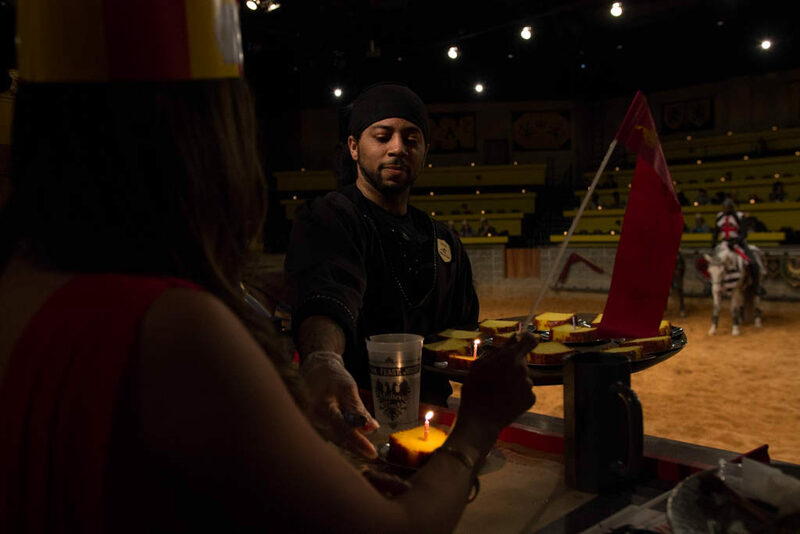 Scott and I gladly accepted the offer to travel back into 15th century Europe to attend Medieval Times. Pulling into the Arundel Mills shopping center, we quickly spot the battlements of a medieval castle. Already, we are back to being little kids jumping around hyper with glee inside of the car. 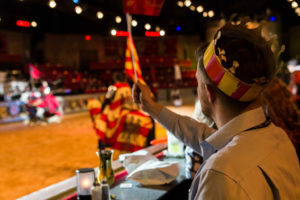 From the moment we are greeted at the ticketing booth to the moment we are bid farewell, we are taken care of by staff dressed in medieval costume speaking in old English. (I was quite impressed that no one ever broke character.) 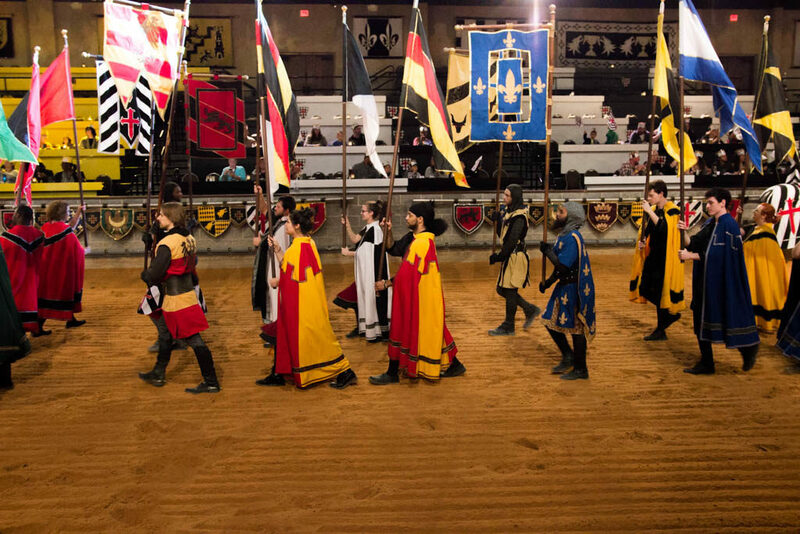 We are handed our cheering banner and paper crowns, and bid entrance to the castle grounds. Upon entering, the Queen and Lord Chancellor personally welcomes you to the event. 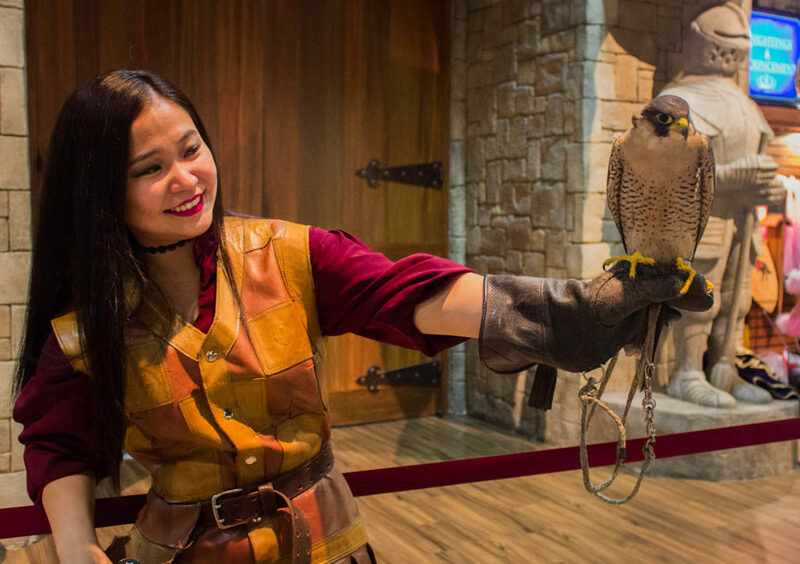 The Royal Falconer is also present to introduce guests to the beautiful art of falconry. 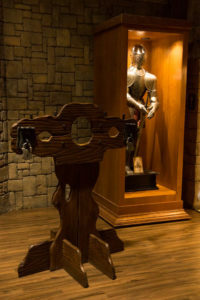 At a $2 additional cost, visitors may tour the “dungeon” which holds a variety of medieval torture devices and artifacts. 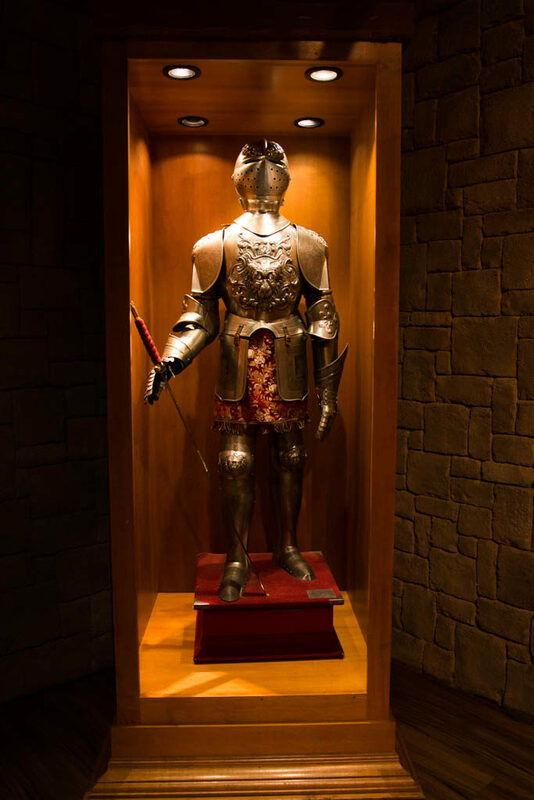 If you are a fan of the middle ages, there is a large gift area where you can purchase anything from dragon collectibles to princess tiaras and even a full suit of armor. 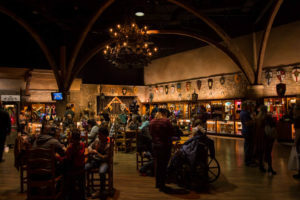 Furthermore, and perhaps most importantly, there is also a full bar complete with frozen cocktails, goblets of ale, and chalices of wine to get you all riled up before the tournament. The gift shopThere are a large variety of gifts available to browse and purchase. The stocksDon't misbehave or you may wind up in the stocks! 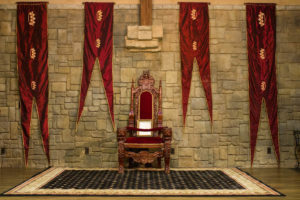 The throne roomYou may register for a Knighting ceremony on your birthday. 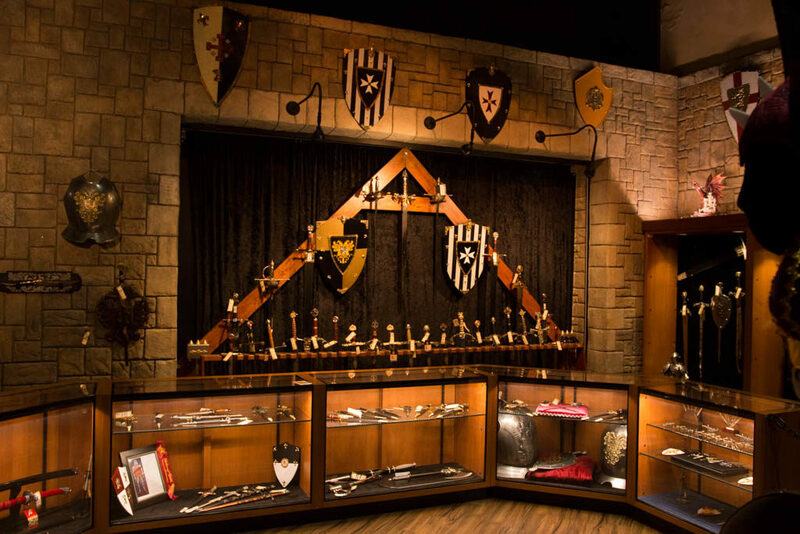 The main hall of the castle grounds.There is plenty to see and do in the castle before entering the arena. A blast of trumpets interrupts the crowd wandering about the castle. We are escorted into the arena by our “wenches” and “serfs” who would be caring for us throughout the night. 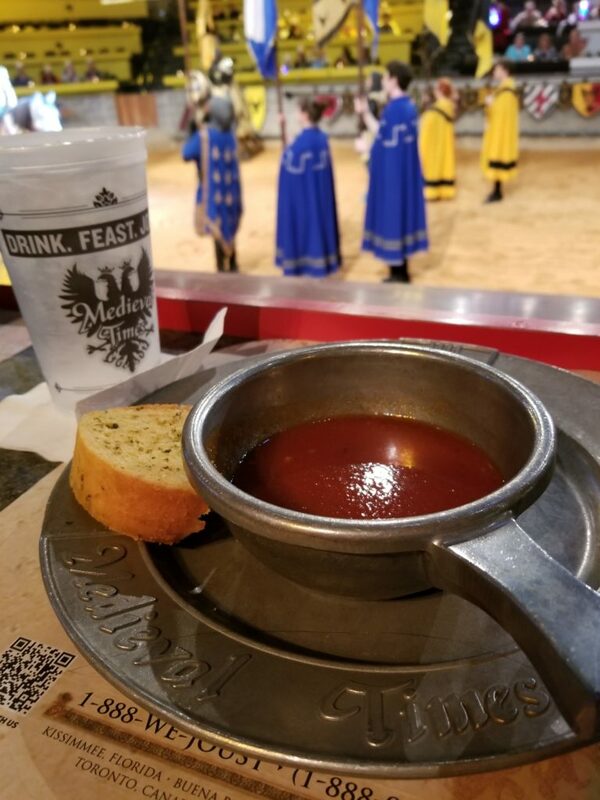 The entertainment promptly begins as we are served our first course of garlic toast with a second course of “dragon’s blood” (tomato soup). An Andalusian stallion enters into the arena guided by the Master of Horse, where they perform an impressive show of horsemanship. 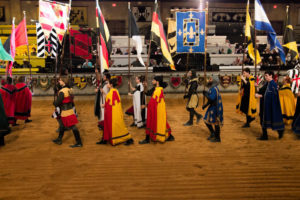 The Queen, Lord Chancellor, knights, squires and various “serfs” and “wenches” (our very own servers/hosts throughout the night) parade out onto the arena where we capture our first glimpse of those who will be fighting for glory. 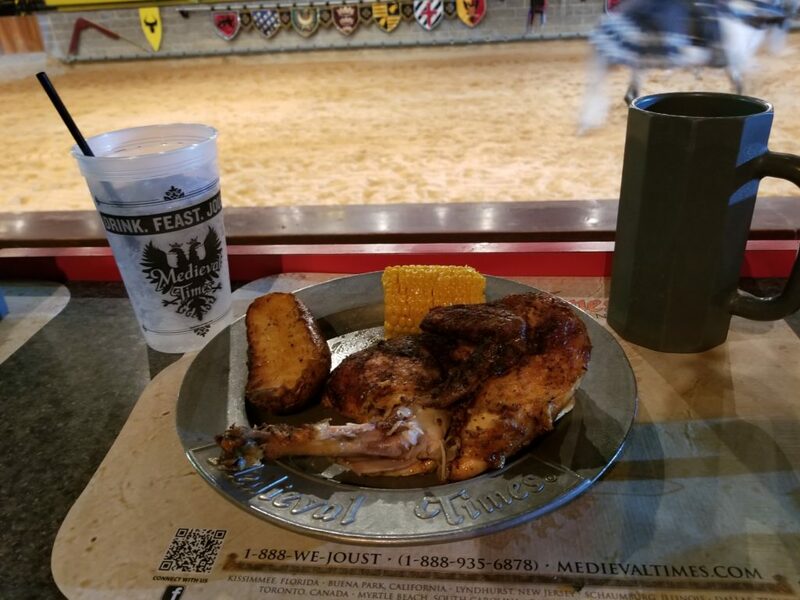 Our second course of corn and seasoned potato is brought to our table along with the third course of “baby dragon” (roasted chicken). Meanwhile, the Master Falconer releases a falcon which flies wildly yet purposefully over the guests’ heads, circling about the arena. 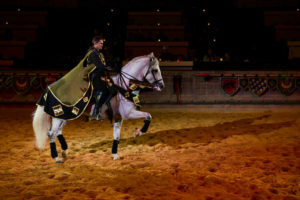 After a fine show by the Queen’s guard, the knights begin the tournament with a series of games including flag passing on horseback and catching rings on a lance. With the serving of our final course, a pastry of the castle, the Queen names the champion. What no utentsils? That's right. 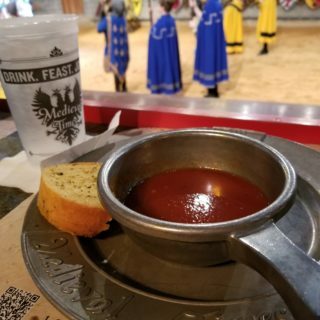 There were no utensils in the middle ages. The Royal ParadeThe Queen's guard, knights and squires parade into the arena. 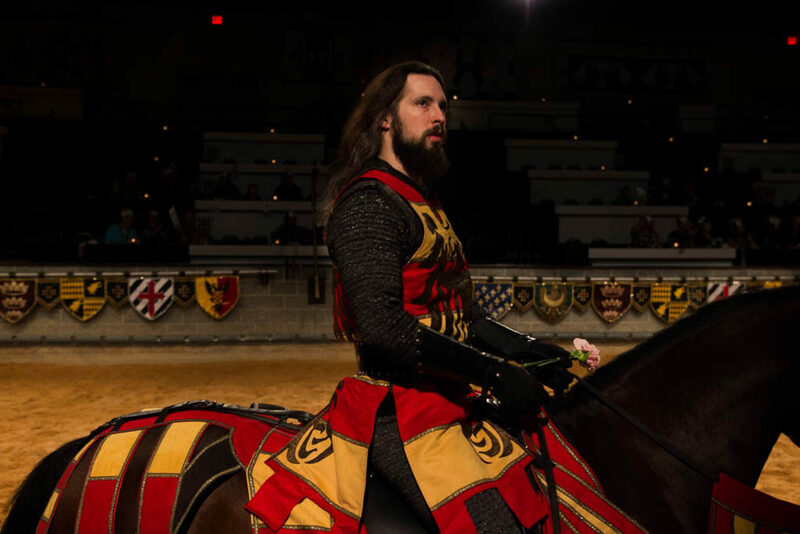 Our knight!Our knight delivering carnations to the fair ladies in the audience. 4th course: Being served my birthday pastry of the castle. 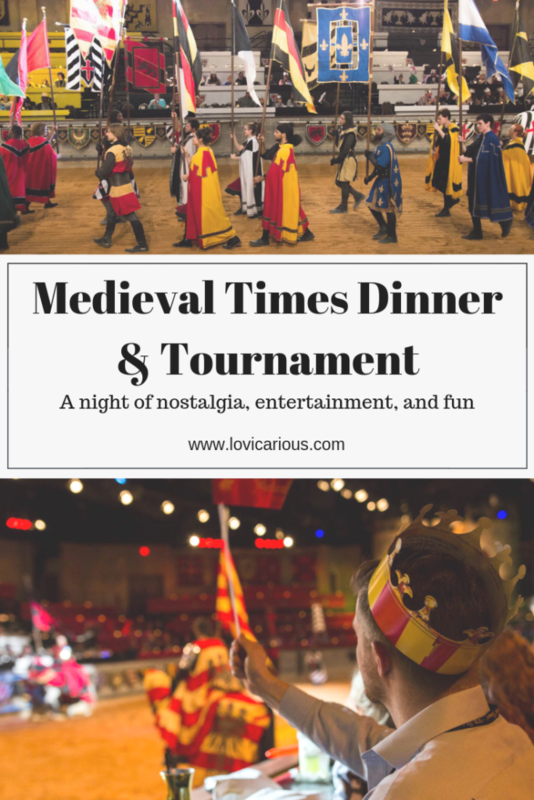 The first time I attended Medieval Times was in 1989 with my grandma in Chicago, Illinois. Witnessing the spectacle again 29 years later brought back such a sense of nostalgic joy. 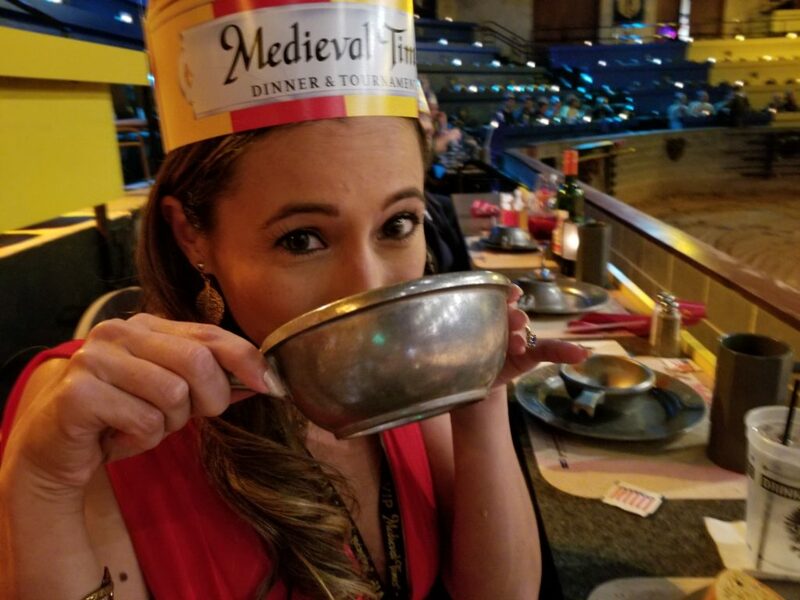 Nothing had changed: my delight at being called “me lady” throughout the night; the sheer amusement of being told I was served “baby dragon” and then being able to tear it apart with my hands; even that bowl of tomato soup was the very same taste that I remember slurping on as a child. Ok, I take it back. 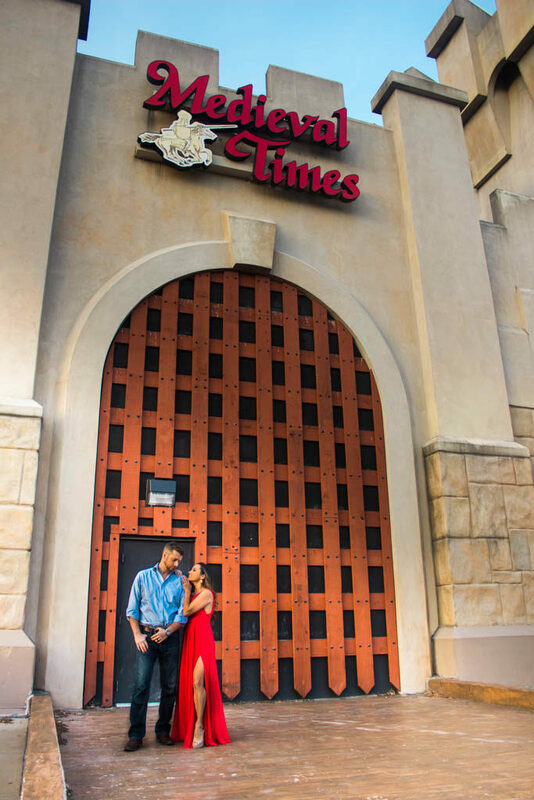 In its 35 years of operation, Medieval Times has made one significant change which is the passing of the throne to a Queen. 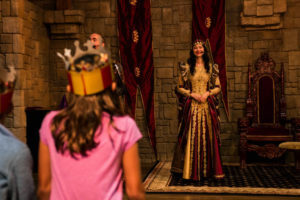 Up until a year ago, the script had always championed a King whose daughter, the princess, took up only a minor role throughout the show. The spotlight and power have now been bestowed upon a woman who rules the realm fiercely yet with compassion. In a time of the “me too” movement, the change has been well received by guests. As mentioned, there is a lot to see and do before the show actually begins. 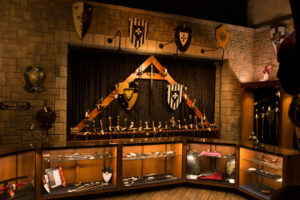 Shop, tour the dungeon, snap a photo with the Queen, meet the Royal Falconer and her falcon, etc. Furthermore, seating is based on a first come first serve basis (within your color’s section), so it is a good idea to be present when the arena doors open. Although there really is no bad seat in the house, coming early at least guarantees your pick of seating. 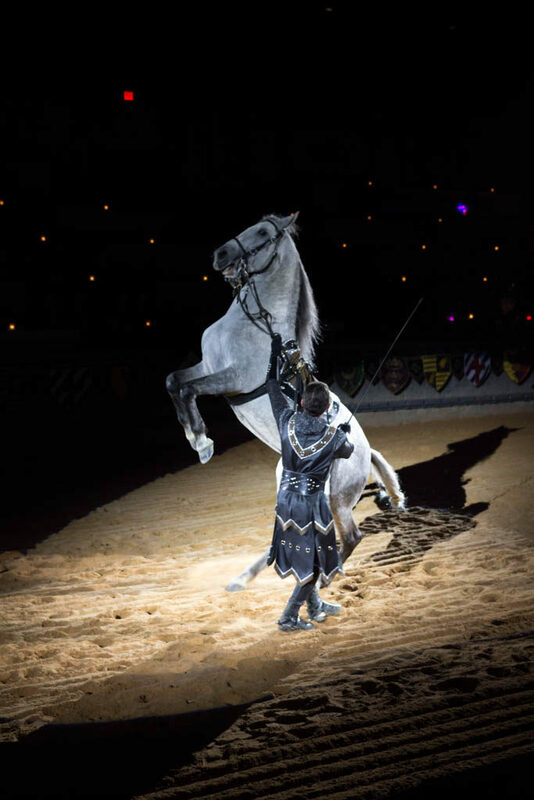 We recommend arriving at least an hour prior to show time. 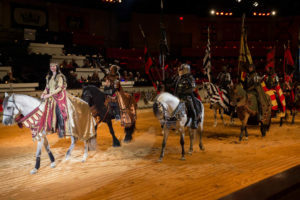 The price is generally $59.95 for general admission and $36.95 for children 12 and under. However, if you subscribe to their newsletter, entrance is free during your birthday month with the purchase of a full price ticket. Additionally, they usually have seasonal discount codes available on their website. Lastly, there are various upgrade options which are worth your consideration. These packages include souvenir lanyards, cheering banners and more. The first time I went was as a young child in the 80’s. 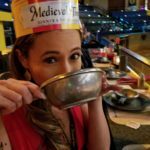 The second time I went, was for a birthday date night with my hubby. You will see young kids, couples, and adults alike enjoying themselves. 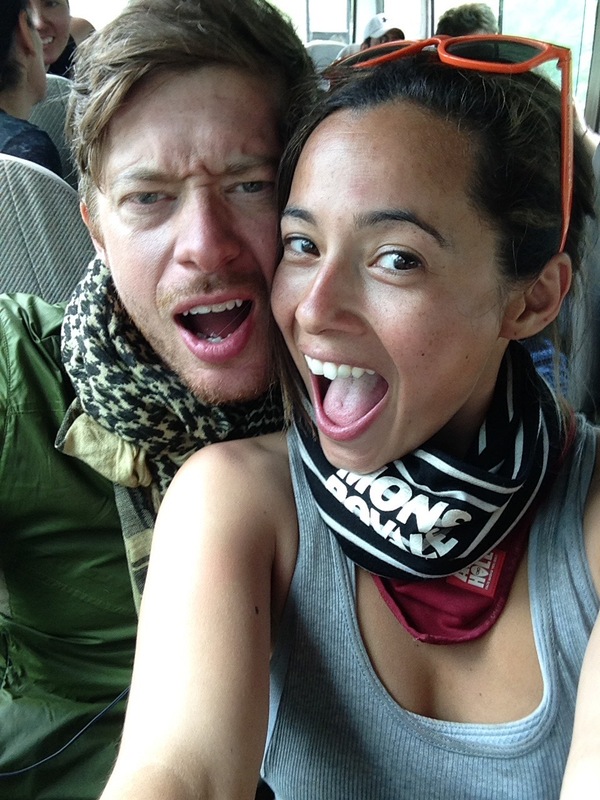 There is no age limit to having fun on this adventure. The only limit to your enjoyment is your ability to let loose, reconnect with your childlike imagination and have fun! This is not the place to be quiet and reserved. 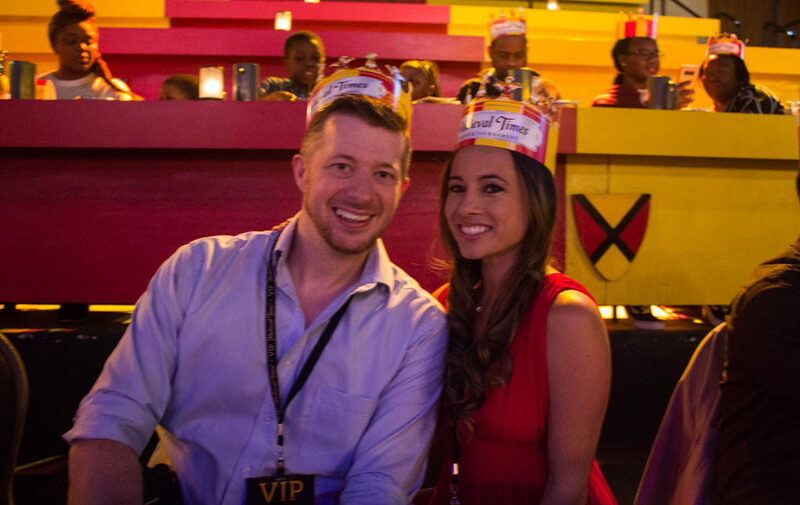 As a guest of the Queen, you are part of the show! 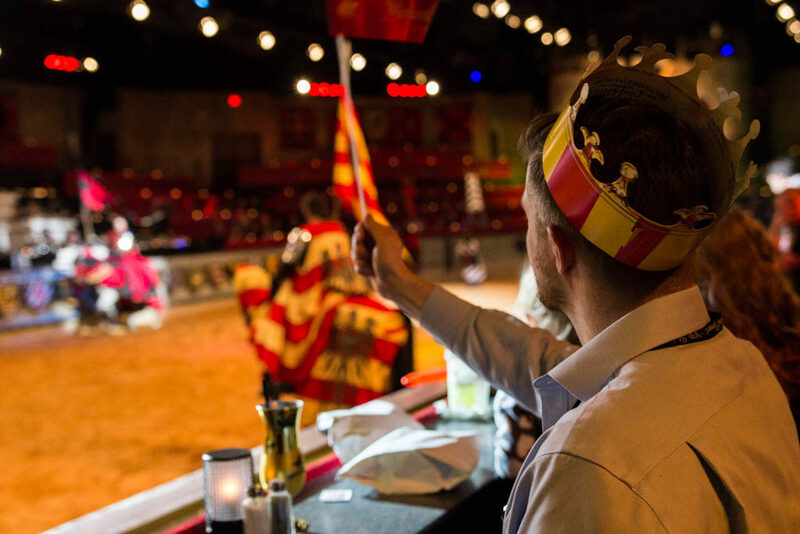 Cheer for your knight and “boo” the opposing teams. The “wenches” and “serfs” do an excellent job at encouraging you to scream, yell, and cheer. Admittedly, I haven’t screamed that much since a Backstreet Boys concert in the 90’s. Medieval Times Dinner and Tournament is a themed dinner theater with its first US location opening in 1983. 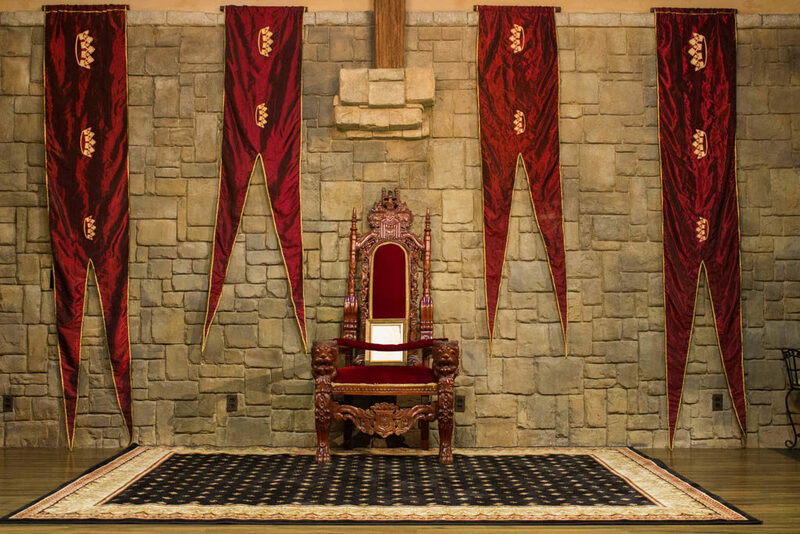 There are now nine castles across North America: Atlanta, GA; Baltimore, MD; Buena Park, CA; Chicago, IL; Dallas, TX; Lyndhurst, NJ; Myrtle Beach, SC; Orlando, FL; Scottsdale, AZ; and Toronto, ON. Wow, looks like you had an amazing birthday celebration. Im planning to visit USA soon, will try to keep this in my itinerary. Thank you for sharing. This is like one of those experiences you only see in movies, I would absolutely love to be able to do something like this! It looks like SO much fun, and that food is making my mouth water. I am so glad you enjoyed it! The food is simple yet so tasty, and the best part was being able to eat with our hands. I love that they kept it all in the theme of the time period. It was very well done. 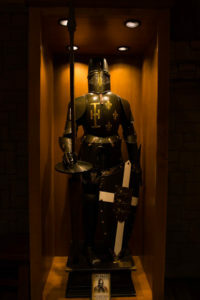 The event is an entire production including special lighting, music, sound effects, costumes, etc. 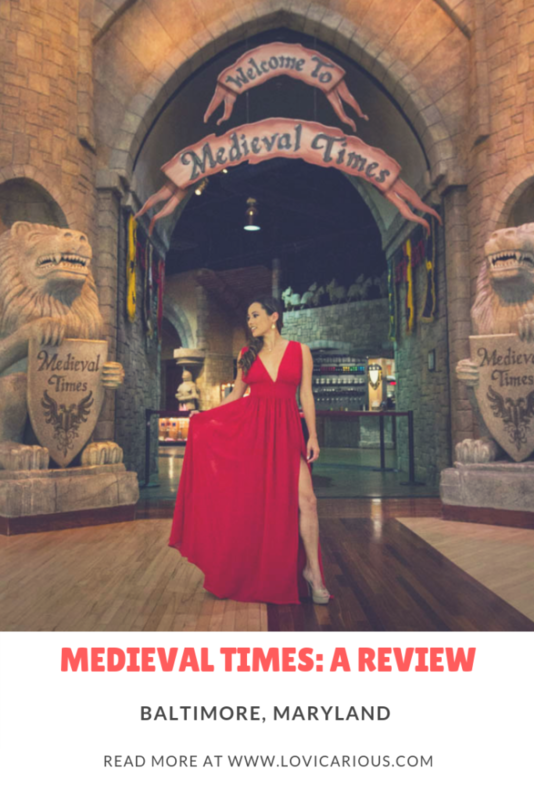 We really were impressed with the overall quality of the experience. England must have some incredible reenactments like this! 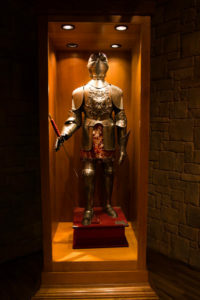 We had the opportunity to see Warwick castle in London and I believe they had some sort of medieval reenactment there.